this line will close MySQL connections before making sure that all the queries are done (which may not save the last thing a player do before closing the server) plus it will dump a core file since the db core will abort without successful exit! This page is no longer available. It has either expired, been removed by its creator, or removed by one of the Pastebin staff. sorry i edited the file after putting the link .. didn't thought that the link will change! It will be nice if you can write below your post what exactly you edited. You can edit a little more, I think it will look better. Clear dirty korean commands, unused veriables etc. @Koray Can you share with us your better code solution? Thank you for your public! Which requirements are needed for use this AsyncSQL? I Fixed it! Missed the hotbackup source! 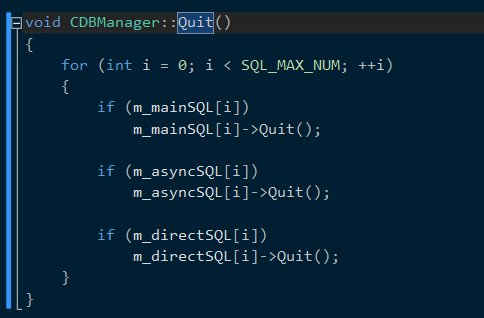 You should check if the thread is already joined, or just simply check if you already called Quit, cus db is crashing at the very end of the process, because quit is called from the db too (and also from the destructor of CAsyncSQL).